I've been waiting for a chance to hit some of the winter clearance sales, since I know what were holes for me this winter (a navy sweater!). Today the chance came. Here's the damage. Which of these are keepers? 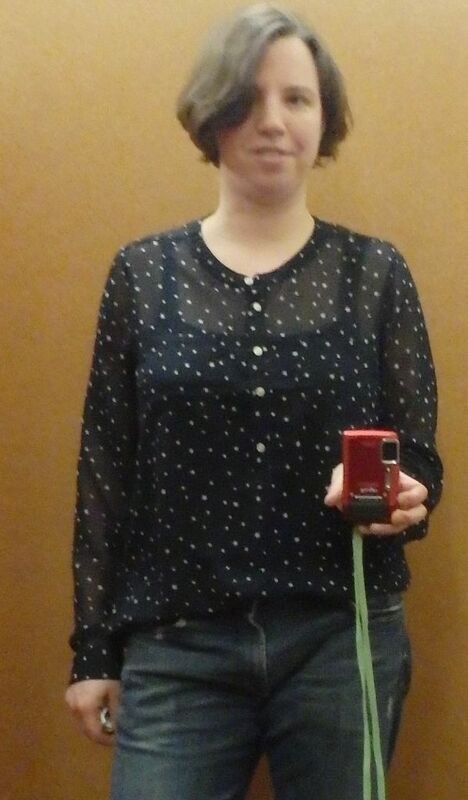 #1 Star shirt - it's sheer, and I'll wear it with the cami underneath pictured, I'm thinking. #4-5 A trench coat from a garage sale. It has a zip-out lining, and no brand information. Made in USA though, and seems well made. Does it fit properly? 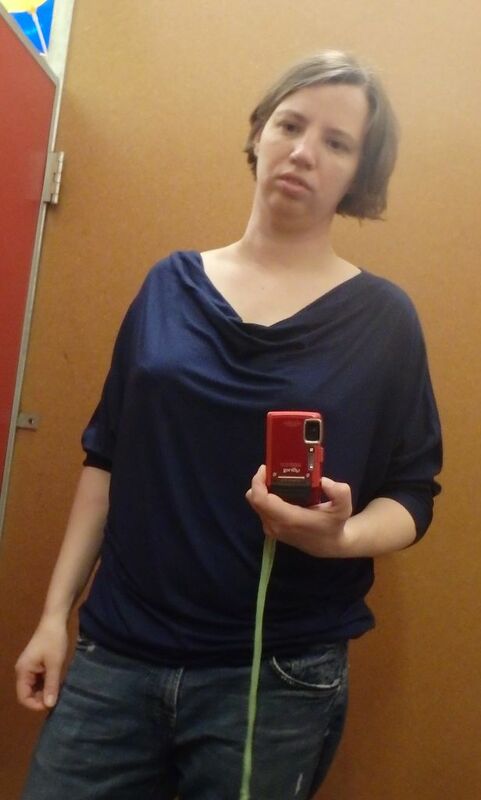 I bought a navy sweater too, without pics, because it was perfect and $2. 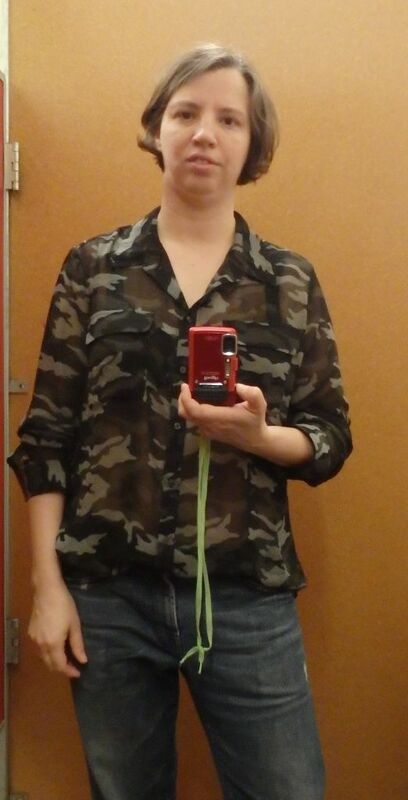 And I didn't buy the camo shirt in #3 because it was #1 or #3 in my mind, and I decided on #1. I'm kinda waffling on that decision though - should I exchange them? (I thought #3 was a bit too big). The trench is great, what a bargain! I really like #1 on you, I'd say blousey over too big. While normally not a camo fan, I like the shirt and think it fits you well. I love #1. The coat is nice but I think it looks big on you. However, if you need a coat it can work because you can wear it over a jacket in the Fall and it will still be comfortable. The star shirt seems is a good fit and may be a style departure from your usual. For me, the small pattern and fluid material read more feminine then your usual outfits, but not in a bad way. I can see it dressed down with skinny jeans or dressed up with a skirt. The camo shirt really seems like it fits with your tom boyish style. The colors looks especially flattering on you. Love it! The trench is a steal! I think #1 was a great choice -- it seems more versatile than a camo print would be and will go with your bright jeans and skirts better than camo print would. The camo print, by the way wasn't green like it shows in the pics - it was gray scale. (Black, dark gray and light gray). I like the star shirt very much and agree with greycat6 that the camo print shirt suits your personality. I'm not sure about the trench; it does seem a bit big on you. The star shirt is my favorite and the camo looks good too. I have a hard time assessing trenches so I will say not sure. I really like #1 and #3. I think the trench looks a little big, but it probably won't be when you wear it with your winter sweaters and blazers. Hmm.. Lots of love for the camo - you're making me think about going back to get it. It'll be a couple of days before I have a chance though, so it's likely to be gone. Still, next time I'm in an Old Navy, I'll look for it. You will have to decide whether or not you are comfortable with the sheerness of 1 (is 3 also sheer?). It looks great on you. 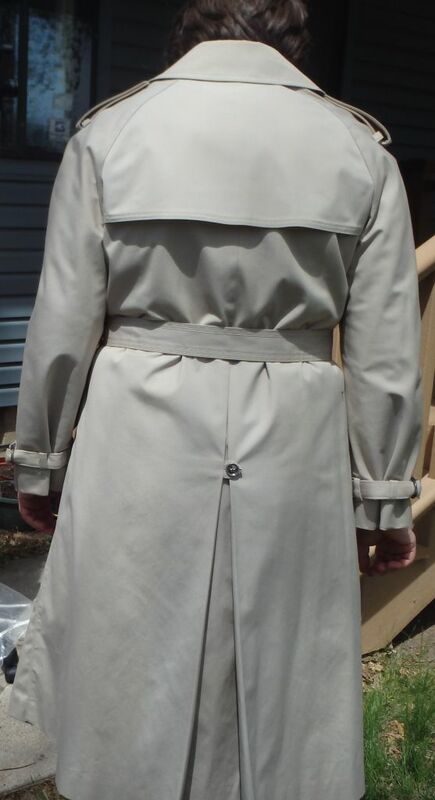 I like the trench from what I can see, except that the sleeves look like they might be a bit short, but am no expert. That's what I thought. I like 3 better than 2, but that's not what you asked. 1 looks modest with the cami. Love 2 and 3, Amy. 3 would look so great with a lot of your ensembles. I like #1, too. As for the trench --- I favor a softer drape in this style of coat, and a bit deeper color, but I've never found one that suited me, so take my opinion with a grain of salt. Sorry, but I also really like 3 on you, but think it needs a cami. Also like 1. Not crazy about 2. I'm not good at judging trenches, but I think this looks good, esp if it will comfortably fit toppers under it. I will admit that I have a poison eye for camo so I believe you were right to let that one go! I like the other 2 tops. Is the trench a bit big? I'm not sure if the belt is hitting at the right spot but I'll let others advise on the fit. I like both #1 & #3! Sorry to add to the confusion! Great steal on the trench too. I'm hopeless for fit, but a trench seems like a useful staple. I love 1 and I also like 2. The color is lovely on you. I am not a big fan of camo print although this does look nice on you. A sheer camo print is a nice juxtaposition of girly and tough which is exactly your style persona. I am not sure about the sizing of the trench. I will leave that to the experts. I like 1 better than 3 - I think the camo colours are a bit draining on you although camo suits your vibe. I'm not liking the fit of the trench seems to big. If you went with a trench I'd like to see you in something shorter and more fitted. I like both 1 and 3; not crazy about 2. I think with regard to the camo or the star shirt, you'll want to think about your current style aspirations. The camo is more suited to your tomboy look, but the star one is more feminine. Which do you think would be best for your wardrobe? Mo had a post not long ago about deciding between two different items, and she decided to go with the one that wasn't as much her usual style so as to try something new, in case that helps. I don't think the camo top looks too big; it looks intentionally a bit oversized, but for the vibe of the top, it works--as long as it's still comfy and won't be a pain to keep adjusting. As for the trench, I think the fit is OK, but the overall effect isn't super flattering. The belt looks like it is a little high. I think you could do better. I like the camo shirt the best! I think the fit is the most flattering, at least in the pics. I think the trench is a useful piece and although the fit doesn't look perfect it would work fine. i love #1, but i also love #3. #2 is nice, and a good basic, but compared to the other 2 is, well basic. but of course, we will need basics, so i can definitely see it in your wardrobe. as for the trench, can you try it with the belt a little lower? Hi, Amy. I like the blue star top and agree with the point that it will work well with your bright or white jeans. The camo is also nice in the photo but if the tops would serve similar purposes then I think you made the right choice. #2 doesn't "wow" me but could be a good layering piece and if that is needed, then it will end up working well for you. As for the trench, I'm not sure. In the photos, something feels a bit off. I see what Joy sees with the sleeves being on the short side. And there is something about the fit at the top that doesn't look right to my eye -- some pulling or bunching across the armpit/ bust area? It might just be the way you have belted it, though. You know I am Ms. Fusspot about fit, however, so YMMV. I like the star shirt and I think you will get a lot of use from the trench coat. I think it's the too wide cut on the hips of the trench that are preventing it from being a 10. I love all three tops on you actually, which includes #2. Great for your lifestyle and style persona. #1 is so fun! It's different than what you normally wear, but I think it will be nice for spring. I like #2, as well, and I think I should refrain from comment on #3, as I have a poison eye for camp. The coat looks like a good placeholder until you find the perfect trench!